Video highlights from Barrie Colts 3-2 Win Over London Knights. #OHL - Very Barrie Colts | A website covering the Barrie Colts of the OHL. 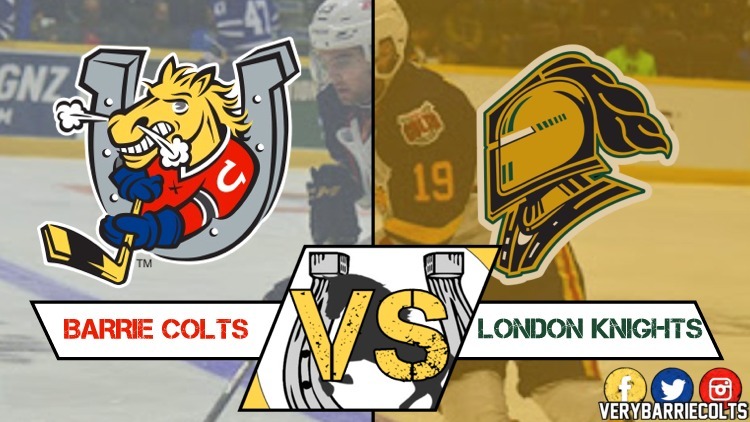 Last night the Barrie Colts beat the London Knights 3-2 at the Barrie Molson Centre. Jet Greaves had an outstanding game, Ryan Suzuki did Ryan Suzuki like things while Dalton Duhart would get the game-winner against his former team. It is always nice to pick up a W over London! Here is a look at the highlights and stats from last nights big win! Ryan Suzuki got 2 goals. Dalton Duhart got 1 goal. Tyler Tucker got 1 assist. Jake Tortora got 1 assist. Luke Bignell got 1 assist. Jet Greaves made 32 saves. The Colts next game is Saturday at home VS the Jaden Peca and the Soo Greyhounds at 7:30.